Vivekananda Kendra Vidyalaya is a project of Vivekananda Kendra Kanyakumari, a spiritually oriented service mission. Kendra is having 815 branches & activity centres, working especially in the tribal and rural areas of India spreading over in 22 states to give a practical shape to Swami Vivekananda’s ideals of “Man Making And Nation Building and Service to Humanity Is Service To Divinity”. At present Kendra is working in the field of Education, Rural and Tribal Development, Medical care, Socio-economic programmes, Publications, Yoga etc., since 1972. Vivekananda Kendra Vidyalaya, Kallubalu village is in the out skirts of Bangalore, started in May 2001 in Kallubalu village, to cater the educational need of around 23 villages in the vicinity. At that time the school started with 100 students (kindergarten and 1st Standard) with emphasises on Man-Making & Nation Building Education. 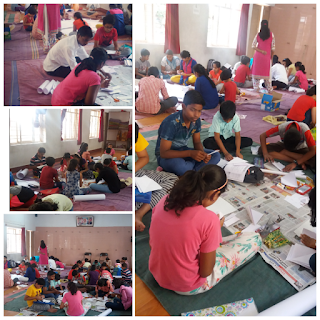 Today we have classes’ from LKG up to 10th standard with strength of 380+ children. Nearly 60% of the students are from poor family and belonging to the first generation literacy program. More than 20 students are getting free education, text books and note books etc. Our Education system is based on the philosophy of Swami Vivekananda’s “Man Making Education” i.e. not only making the child self reliant, discipline, confident, independent, truthful and selfless with noble qualities but also taking care of child’s five-fold personality development i.e. Physical, Mental, Emotional, Intellectual and Spiritual level. Medium of instruction in the Vidyalaya is Kannada up to 5th standard and from 6th standard onwards English. Hindi is also being taught from Standard 1. The specialty of our education system in the nursery level is activity oriented i.e. child learns by doing various activities. The teachers will create an atmosphere of self learning. We believe in Swami Vivekananda’s famous quotation “Education is the manifestation of the perfection already in the man”. We try to bring out that perfection in the child. Along with perfection, we also emphasise on the discipline, character building and concentration of the child. Besides following the regular syllabus, they also learn through Yoga, Art of concentration, Indigenous games, dramas, skits, dance, patriotic songs, Sanskrit Subhashitas and Sanskrit shlokas and study of the lives of great personalities from Vedas, Upanishads, Ramayana and Mahabharata, which help them to cultivate good character and values and culturing their emotions. In the Nursery and primary level teachers use teaching aids to impart the knowledge through different activities. Students are exposed to project work both individually as well as in groups. The idea is not only to develop a better understanding of the subjects but also develop creativity and team work. Students are also encouraged to take part in different Inter School competitions and have brought many laurels to the school by winning the top prizes.